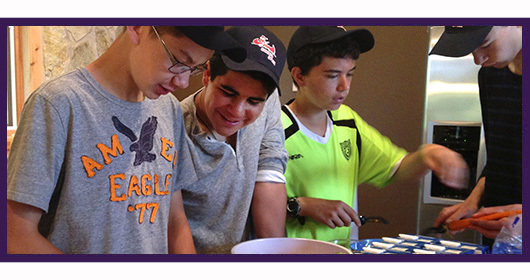 In keeping with our recipe for making, sharing and donating soup we have expanded our soup-making family to include youth at summer camp in our volunteer soup making sessions. 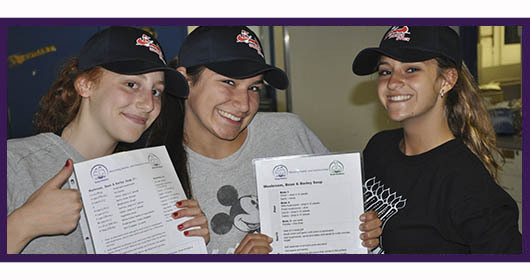 The Summer Stock pilot program launched the summer of 2013 for campers and counsellors to learn cooking skills and become young philanthropists in a hands-on, fun and meaningful way. 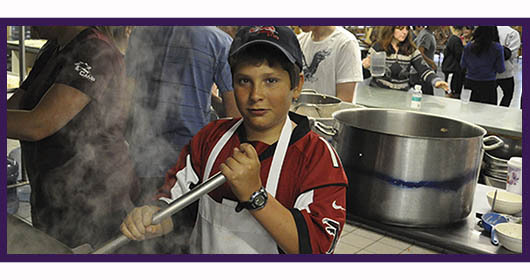 Under the supervision of Camp staff and volunteers, campers over the age of 13, come together to slice, dice and stir their way to a very tangible donation of fresh soup. While the soup is simmering camp counsellors and/or shelter representatives provide an overview and powerful presentation on recognizing signs and symptoms of abusive relationships, how to help a friend, where to get help, and how to stay safe on dates and on social media. 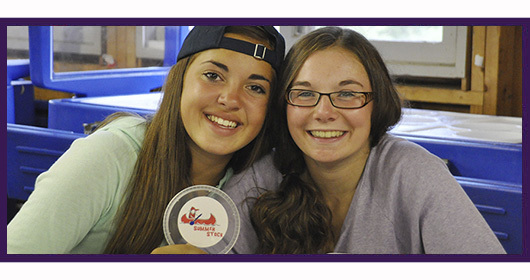 In short, Summer Stock aims at conveying a message of healthy relationships that foster respect for one another all while being delivered within a safe and supportive youth-focused environment. In Canada, one out of three teens will experience abuse in their romantic relationship before they graduate high school. Education and awareness on such a prevalent issue combined with the value of entry level philanthropy for this young and impressionable demographic is the underlying mandate of the program. After their lesson in soup-making, campers hand-write Summer Stock labels for the soup containers listing the ingredients. At this time they also have the opportunity to include a hand written personal message to the recipients of the nurturing soup they have themselves prepared. 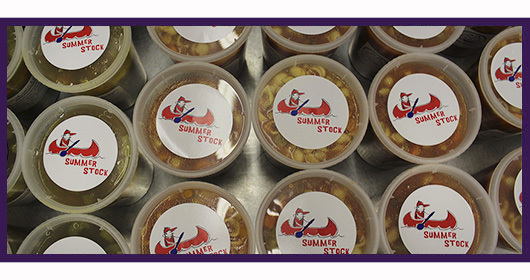 Once fully prepared, packed and labeled, approximately 60 -100 Litres of nurturing and nutritious soup made at each event is then delivered to a near by Emergency shelter and/or youth-in-transition program. Sometimes delivered by boat across the lake the Summer Stock 'hugs in a bowl' provide hundreds of litres of delicious and nutritious soup to women, children and youth in crisis often times in remote areas. 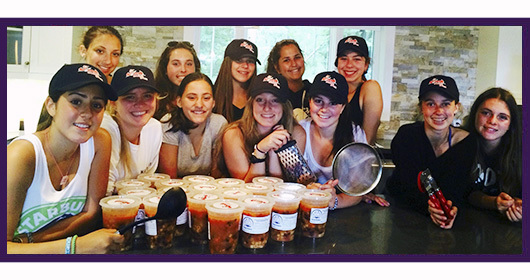 Since the Summer Stock program began 6000 servings of soup have been delivered by our amazing summer soup-makers! "I think it was great for the kids to be there for the delivery, as they got to see exactly who they were giving to." "Thank-you for including us! It has been a great experience. I hope we can run it again at camp for many years to come!" "We truly loved the fact that we were included in this event. The soup was very delicious & well received by the clients & staff at the Shelter!" 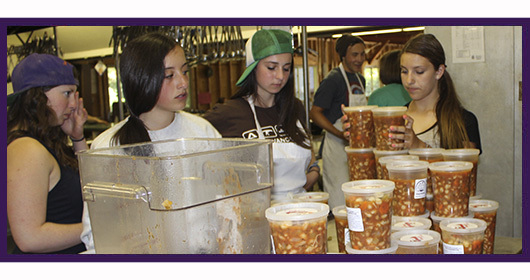 "I felt it was a heartfelt experience for the campers to bring in the soup & learn about the shelter by going on the tour." 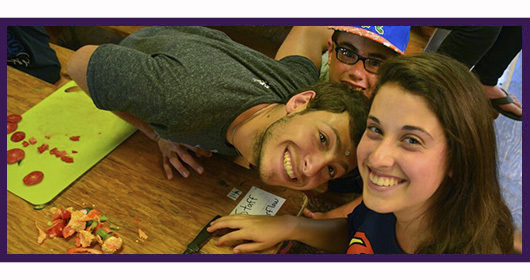 "We absolutely loved this and thought it fit so well within our values and our mission at camp." "Thank you so much for including (our shelter) in the Summer Stock program. 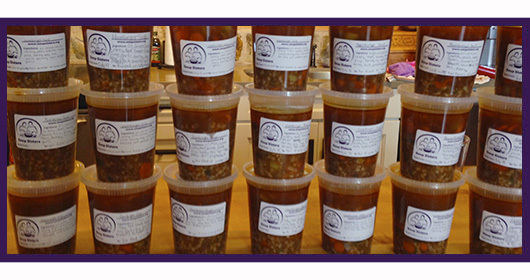 Our shelters benefitted greatly by having fresh healthy soup delivered to them twice during the summer." "We have spread the donation to various programs and activities where it is very much appreciated and needed."